Robert I. Long is the principal of The Law Office of Robert I. Long, founded January 1, 2000. He obtained his Juris Doctorate in 1983 from Salmon P. Chase College of Law, Northern Kentucky University. He has been in private law practice in Ventura County for over thirty years, beginning as an associate in the Ventura firm of HATHAWAY, PERRETT, WEBSTER & POWERS. From 1995 through 1999 he was a name partner in the Ventura firm of MYERS, WIDDERS, GIBSON & LONG LLP. Mr. Long maintains a general civil law practice with an emphasis in homeowner association and small business representation, real estate, estate planning and probate. His practice is balanced between general counsel work and litigation. 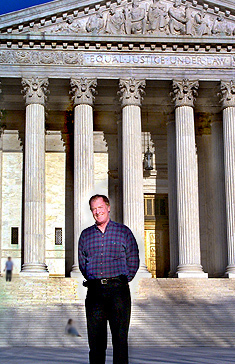 He is admitted to practice in California state and federal courts, and to the United States Supreme Court. Copyright 2017 Robert I. Long All Rights Reserved.